3.) Write about your favorite place to eat when you were a child. Growing up in a rural area in the 1950’s/1960’s, eating out was a very rare occurence. The first time I actually remember eating at a restaurant was probably when I was around twelve years old. I was on a day trip to Williamsburg with my aunt and my grandmother. Eating out was a luxury that was unheard of around our house. So, I must say that my favorite place to eat as a child was: in our kitchen. 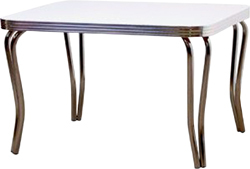 Our kitchen table was the formica and chrome type. Because the room was fairly small, the table was pushed against a wall. There was a window, looking out on a screen porch, beside the table. Since it was usually just my Mom and me at the table (my dad died when I was an infant), only two of the four chairs were used regularly. Both my sisters were married by the time I was four. So when they visited with their families, we’d pull the table away from the wall, round up extra chairs, and everyone would squeeze close together for the meal. There were times that we may have had as many as eight people crowded around a table meant for four. Summertime meals were mostly vegetables that Mom grew in her little garden: corn, green beans snaps, green garden peas, fried squash with onions, cabbage, potatoes. Dinner was served in the middle of the day, and supper was at night. Sunday dinners seemed to always be fried chicken, mashed creamed potatoes and peas. Sometimes Mom would have fish, which I didn’t care for, but I loved the (homemade) cole slaw and fried “lacy” cornbread patties she always served with it. Pork chops were an occasional meal, as was spaghetti. Since my nieces and nephews visited quite a bit, we always wanted hot dogs or hamburgers and french fries. And Mom didn’t buy the frozen ones: she peeled and cut up her own potatoes. Thanksgiving always meant turkey and Mom’s delicious dressing. She never stuffed the turkey with it, but baked it in a HUGE pyrex dish. It was so good, I remember eating cold leftovers, right from the fridge. By the time I was twelve, I had three nieces and three nephews. So there were many meals around that old table. Lots of spills, probably a few arguments among us kids, but looking back, it’s mostly the good times I remember. But, as I was writing this post, I realized how sad I am that I don’t have a single picture taken in that kitchen.